There are several effective rc airplane training methods when it comes to learning to fly radio control planes (, helicopters & other aircraft), and this page will give you a brief insight in to each one. Hopefully the page will give you some idea of which method is right for you and your situation. The important thing to remember when learning to fly rc airplanes and aircraft is that it will take you some time to gain confidence and better your flying skills. As with everything in life, anyone who wants to learn something new has to start on the very bottom rung of the ladder. I'm currently learning to play the drums, and even after having weekly lessons for six months I still feel like I've only just nailed the very basics! Aaaarghh!! RC airplane flight training is no different and you need to learn to walk before you can run, as they say. What's the other one? Ah yes, "Slow and steady wins the race". How true! The beauty is that these days many rc airplanes and aircraft are very noob-friendly and there is a huge choice of RTF (Ready To Fly) trainers available to beginners. So the chances are that whichever rc airplane training method you decide to go with, your life has already been made easier by the 'flyer-friendliness' of your airplane - so long as you've bought the right type, of course! Incidentally, although these rc plane training methods do apply to all rc aircraft types, for the purpose of this page we'll just stick with airplanes. Without doubt this is the best method of rc airplane flight training, and is the option you should choose if you want to jump in at the deep end with an IC airplane, rather than electric power. Getting yourself along to a local rc flying club is a great idea if you want to take the hobby seriously. Use my rc airplane club directory to see if there's one close to where you live. Most clubs have certified instructors, or at least experienced rc pilots who are willing to teach, and some clubs even have a club trainer airplane reserved for use by new members, so you can 'fly before you buy'! For single transmitter, or 'pass-the-box', instruction your instructor will fly the airplane while talking you through what he's doing, then he'll hand you the transmitter for you to fly the plane. If you get in to difficulty he will take the transmitter from you and regain control of the airplane. When your heart has stopped racing and your hands have stopped shaking, he'll hand back the transmitter and you can have another go. In conventional BB systems the transmitters are joined together by a cable; the instructor holds the master transmitter while you, the student, hold the slave transmitter. With the flick of a switch the instructor can hand over or take away complete control from you, without having to take the transmitter from your hands. The system shown to the right is a true buddy box system whereby the slave Tx (left) can only ever be used with the master Tx (right). In other words, the slave transmitter is not a real one and cannot transmit an actual radio signal. But the majority of modern radio control transmitters have a buddy box training capability, so two actual transmitters can be connected to each other and neither of them are 'dummies'. Buddy box systems aside, one other method of rc flight training you might see at a club is the Ragland Technique, developed by New York based rc flight instructor Clarence Ragland. Clarence has been instructing rc for over 30 years and his method involves side-by-side instruction, but without using a buddy box or 'pass-the-box' system. For the Ragland Technique, the instructor holds and controls the Tx sticks with thumb and forefinger, while the student places his/her thumbs on to the top of the sticks. As the sticks are moved by the instructor, so the student can feel the amount of movement being made and see the response by the aircraft. It's not a widely used method of rc flying instruction, but worth noting. RC flight simulators are very realistic; powerful software runs on your home computer and replicates flying model aircraft down to the finest detail. Some sims come with their own transmitter-based controller while others let you use your own transmitter. Either one is connected to your computer via a USB cable, although I'm sure it won't be too long before that connection becomes a wireless one to further enhance the realism! The range of aircraft and flying sites on the better simulators is excellent, with many popular airplanes, helicopters, jets and gliders being represented. Various parameters can be edited on the virtual aircraft, so if you happen to have one of them in real life then you should be able to adjust the sim model to exactly, or close enough, replicate your actual one. This, combined with using your own transmitter, gives a very realistic rc flight training experience, although it has to be said that there are obviously a few differences between flying a plane on a computer screen and flying one in the real world. These differences are primarily associated with visual references and 'depth of field' distance judging. RC flight simulators are an excellent training aid, second only to club instruction. If your budget allows, you should seriously consider buying one if you're serious about the hobby. 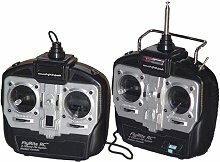 Read more about rc flight simulators. You could be forgiven for thinking that teaching yourself to fly an rc airplane is not a very realistic training method. But the fact is that beginner rc airplanes these days have been designed with the complete newcomer in mind, and are relatively simple to fly. Very basic electric one or two channel rc airplanes can be flown pretty much out of the box, and they make an excellent low-cost introduction to the hobby, although they won't give you a true rc airplane flying experience due to their limited capabilities. Moving up to a 3-channel plane steepens the learning curve a bit, but self-teaching is still perfectly realistic and countless beginners have done it. An electric RTF like the HobbyZone Sport Cub is a classic example, although there are many others to choose from. Self-teaching with a 4-channel airplane (motor, elevator, rudder and ailerons) is still very doable but some rc flight simulator time under your belt will go a long way to giving you a more successful first flight. Above: self-teaching on 3 and 4-channel trainers like these is a perfectly realistic option. With IC powered airplanes however, it's a slightly different story, although there are many rc pilots out there who have self-taught with great success. But if you're completely new to the hobby and know nothing about IC planes and what they need to work, then joining a club and getting a fellow flier to show you the ropes is by far the best option. Learning how to start and tune a glow plug engine, and keep it running, can be an art in itself and if you're not mechanically minded, yet still want to ignore electric flight and learn on IC, then some personal guidance is what you really need. An important note to make about self-teaching is that of flying site location. If you don't intend joining a local club and you have a public space to fly in, such as a park, then that's great, but be very aware that only electric powered rc airplanes are acceptable in such places. IC ones have a much higher 'nuisance factor' because of the noise they make, and they aren't always welcome in public places. However you choose to undertake your rc airplane training is dependant on the opportunities available to you. The kind of aircraft that you want to fly also makes a big difference i.e. whether you're happy to start with a 1 or 2-channel electric park flyer and work your way up, or whether you're keen to skip that level and start with something more serious. Of course, you can combine any or all of the rc airplane training methods talked about above and really accelerate your flying training! The bottom line is that there are no hard and fast rules, but the thing to remember is to be responsible, but have fun while learning your new hobby. For anyone even half-serious about the hobby, I can personally recommend an rc flight simulator regardless of whether you join a model flying club or not. And especially if you intend to self-teach!